The map above shows the location of Rockport in Southern Indiana. It is in Spencer County. 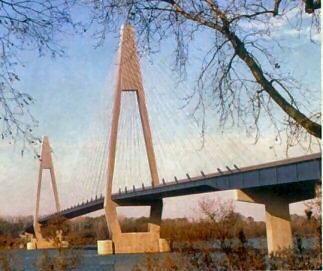 The William Natcher Bridge, shown below, was completed in 2002. The bridge across the Ohio River is approximately 3 miles from the Lincoln Pioneer Village. This map shows the location of the Lincoln Pioneer Village at the west end of Main Street in Rockport, Indiana. Season: The season is from May 1 through October 31. Hours: Open daily 10:00 AM - 6:00 PM from May 1 through October 31. The Village is also open by appointment. To make an appointment, please call 812-649-9147. Fees: $5.00 for Adults, $3.00 for Senior Citizens, $3.00 Children 12 years and younger. For information about the web site, contact Raymond Dawson.